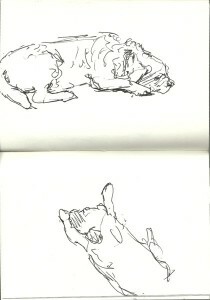 Today I shall share some of the dog drawings from my sketchbooks. 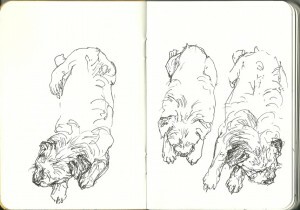 This post is in memory of my Border Terrier, Freddy, who recently died at age 17 years. 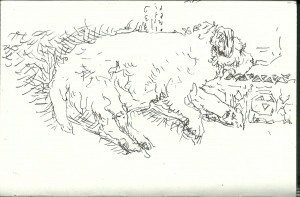 Here are some suggestions for drawing pets, this time illustrated by sketches of my own dog. 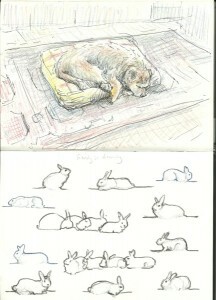 These tips are applicable to drawing any animal from life. Pets make great models, but you never know when they will change position. 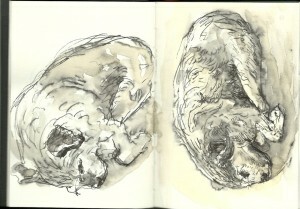 Be prepared to start more than one drawing on a double-page spread of your sketchbook. It doesn’t matter if one or more of these poses remain unfinished. 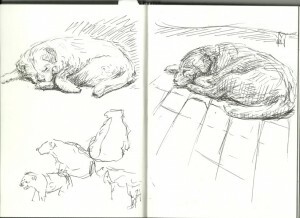 In the two sleeping poses above, I had time to build Freddy’s structure up with pen cross-hatching, and also to suggest his shaggy coat with pen strokes. 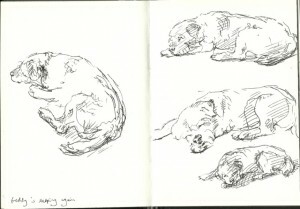 In the awake poses, below, I have used a more fluid style of line to suggest his posture without any attention to tone or texture. 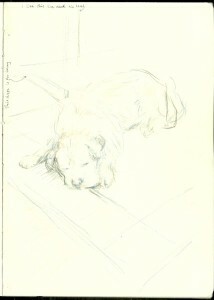 With a panting dog, consider what can and cannot be seen of the lips, teeth and tongue. 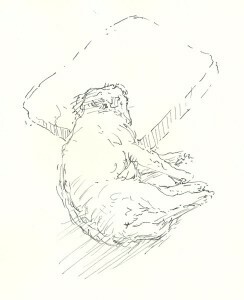 In a shaggy Border terrier, the upper teeth and lips are obscured by hair, and we see a little of the lower canines (those are the long teeth) and tongue). 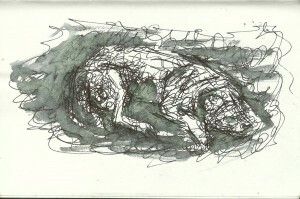 In the sketchbook below, I did a few scribbly drawings of Freddy moving about before he settled down for a sleep. 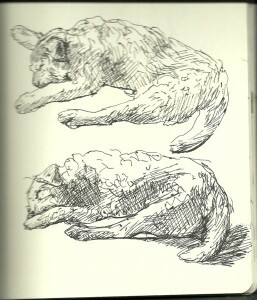 The attempts to draw him in various fleeting postures adds a little character to the pictures of him sleeping. 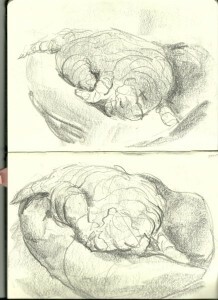 I made these two resting views into self-enclosed peaceful shapes, one on each opposite page. 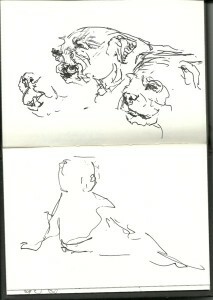 My pen drawings of Freddy were all made very directly, without any erasable under-drawing. 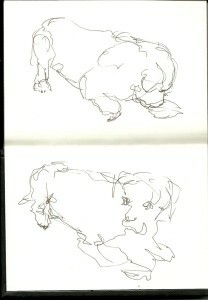 Errors can be incorporated into the drawing. 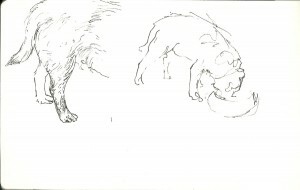 Indeed, multiple lines resulting from error can be beneficial, suggesting that the dog is moving or about to move. What does your pet do? Do suggest bits of your pet’s surroundings in your pictures. 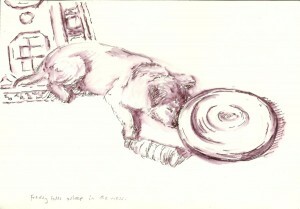 Cats and dogs choose places where they tend to rest in the home. 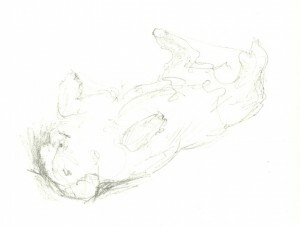 The way in which they sit or lie in these spaces is meaningful and worth recording. Here is Freddy towards the end of his life. 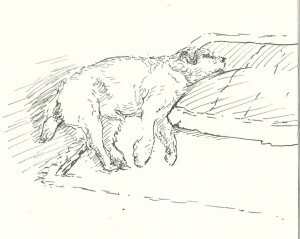 By this stage, he was painful at times and wanted to lie with the left side of his head resting on his bed. He needed human help to get into this position but, once there, he would rest happily. Pets are completely uncritical of our efforts, do not insist that we flatter them, and they do not mind a bit if we try unconventional drawing methods. 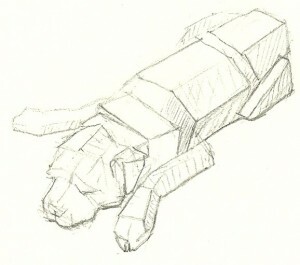 For example, here I used a chunky sticky of graphite to build up an image in cross-contour lines. These are lines that appear to curve over and around the form of Freddy and his bed. 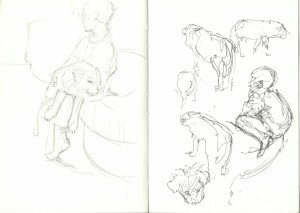 It is a good idea to change your drawing approach as often as possible within your sketchbook. 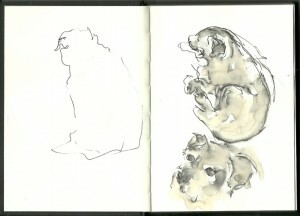 This ensures that your sketchbook looks interesting to those who take a look through it. Different drawing methods also keep you on the ball as an artist, and ensure that you do not keep repeating the same picture over and again. 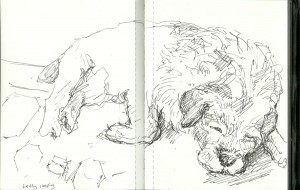 Remember to check this blog again on Sunday, as I shall be posting about sketching dogs in various media, from pen to pastel.